Updated January 8, 2016, with more candidate reactions. For the past five years, Lt. Gov. 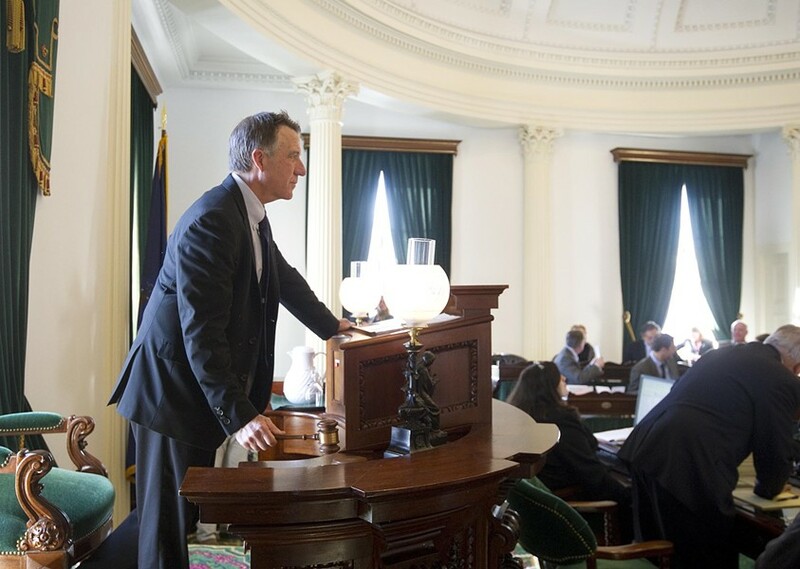 Phil Scott has joined his Republican colleagues in the legislature to offer reaction to the State of the State speech by Democratic Gov. Peter Shumlin — but not this year. Instead Scott, who aspires to deliver the State of the State address next year as governor, sat down in front of a camera at his gubernatorial campaign headquarters and offered his own assessment of Vermont's health. And in a contrived second segment of this live stream, he answered questions posed by a "moderator." As Scott fielded questions on his leadership style, finances and property taxes, four women — campaign volunteers — seated at tables behind him kept their eyes glued to their computer screens. "Vermonters expect and deserve a renewed focus on making Vermont affordable," Scott declared in his opening statement. In gentle jabs at the party in power, he suggested that the legislature and governor had been overly optimistic about revenues for the past five years. The result: budgets to operate state government that spent more money than was available. "I'm frugal," Scott declared. Such fiscal prudence was the signature characteristic of his response to the governor: "I won't sign or propose a budget that grows faster than the previous year's." In his trademark polite way, Scott also chided the majority party for creating economic uncertainty by having a lengthy public deliberation about a single-payer health system. And now, Scott said, Democrats want to consider another unsettling initiative — a tax on carbon. "We need to stop it in its tracks now," he said, explaining that businesses need stability and certainty to grow. Scott's statement steered clear of assessing most of the initiatives Shumlin outlined in his speech — including the governor's qualified support for legalizing marijuana and his call to stop investing pension funds in fossil fuel stocks. He agreed with Shumlin's support for the Vermont Enterprise Fund, which offers incentives to businesses that expand in Vermont. Scott is one of four candidates running for governor. Shumlin announced last spring that he would not seek re-election to a fourth term. Retired Wall Street financier Bruce Lisman is competing with Scott for the Republican nomination. The two Democrats are Matt Dunne, a former lawmaker who now works for Google, and Sue Minter, also a former legislator and most recently Secretary of the Agency of Transportation. Minter, meanwhile, applauded the governor's proposal to provide financial assistance for a semester of college for first-generation students and low-income workers who want to return to school. She agreed, too, with his support for a paid sick leave bill. She said both initiatives "are direct investments in working families." Minter also endorsed Shumlin's call for state pension plans to unload their fossil fuel stocks. "We should divest our coal holdings," she said, "and reinvest in areas that are better for our economy and more in line with our values." In his own statement, Dunne called the address “Gov. Shumlin at his best: funny, policy-focused and bold.” He similarly praised Shumlin’s divestment and higher education proposals, as well as his cautious approach to marijuana legalization and renewed emphasis on battling opiate abuse. Dunne, who sounded an early call for amending elements of last year’s school district consolidation law, said he was pleased that Shumlin called for delaying or repealing new per-pupil education spending caps. “By removing these caps we will avoid punishing the taxpayers particularly in many of our poorer districts,” Dunne said.